Living as a Muslim minority in the West, I have often felt frustrated by religious intolerance, but also from a community that does not fully honor the rights that are accorded to women in Islam or provide many outlets for women to become scholars. This was the case in late 18th century West Africa, in what is now modern day Northern Nigeria, when Uthman Dan Fodio criticized oppressive customs and encouraged female education. Nana Asma’u bint Uthman Dan Fodio was a product of her father’s commitment to quality Islamic education for women. She became a legend in her own right and through her writings and education movement, ‘Yan Taru, she has inspired countless women for generations. As a Nigerian with dual American and British citizenship, researcher Rukayat Modupe Yakub is aware of the legacy of Nana Asma’u. Rukayat points outs, “For so many Muslims Nana Asma’u is still unknown, but for those who are familiar with her she was an educator, writer and poet who was passionate about education, For this reason you find schools in places like Nigeria named after her.” In addition to her poetry and education movement, Nana Asm’au is also considered an Islamic leader who was known for her ability to mediate political disagreements. She was fluent in Arabic, Hausa, and the Tamasheq language of the Tuareg. Like her father and brothers Muhammad Bello and Abdullahi, Nana Asma’u was a prolific writer who left a tremendous literary legacy. She wrote to keep her father’s memory alive in the minds of the people and in support of her brother Muhammad Bello’s Caliphate. At 27, she was given the task of organizing her father’s corpus of works, all while overseeing a household of several hundred people and ensuring that they were provided for. Jean Boyd gained access to her works in 1975 and later wrote The Caliph’s Sister, which provides a detailed biography of Nana Asma’u’s life and legacy. Jean Boyd collaborated with Beverly Mack to compile her poetry and religious treatises in Collected Works of Nana Asma’u, Daughter of Usman dan Fodio (1793-1864). The book compiles her impressive body of poems and treatises in Arabic, the Fula language, and Hausa. Beverly Mack and Jean Boyd also co-wrote a book which analyzes the social and political function of many of her poems titled One Woman’s Jihad: Nana Asma’u, Scholar and Scribe. Rukayat says that Nana Asma’u continues to serve as an important inspiration because “She was involved in social work and had political clout, she was a mother and wife, sister of the head of state, daughter of a legendary a political and spiritual leader, she could have had any life she wanted but she choose to be of service.” Around 1830, Nana Asma’u trained a group of women to travel around the Sokoto Caliphate to educate women. Each woman in this cadre held the title jaji (leader of the caravan) to designate their role as female leaders. One hundred and eighty years later, Dylia bin Hamadi Camara is one such Jaji who explains, “We have the name of all the jajis before me so mine comes after a long line of the unbroken chain of scholarship and service to women, children and the Ummah at large.” Jaji Dylia explains that the methodology of learning that Nana Asma’u develop still educates men, women, and children. In the United States, the ‘Yan Taru Education Foundation and Charitable trust has chapters in Pennsylvania, Texas, Alabama, Georgia, and California with 33 women in intensive training and intensive seminars and classes which are open to the public. * Teachers like Jaji Dylia travel internationally and use email, teleconferencing, and text messaging to educate their students on classical Islam. Preparing for a trip to Guinea, Dylia stated her next goal is to translate Nana Asma’u’s teachings into French because the Francophone world has largely been unaware of this rich legacy. My hope is that we begin to learn more and more about the named and unnamed women who have been responsible for educating our ummah. They have passed on a rich legacy, one that reminds me that even when faced with the greatest challenges, we as women can be brilliant and provide guiding lights for others. 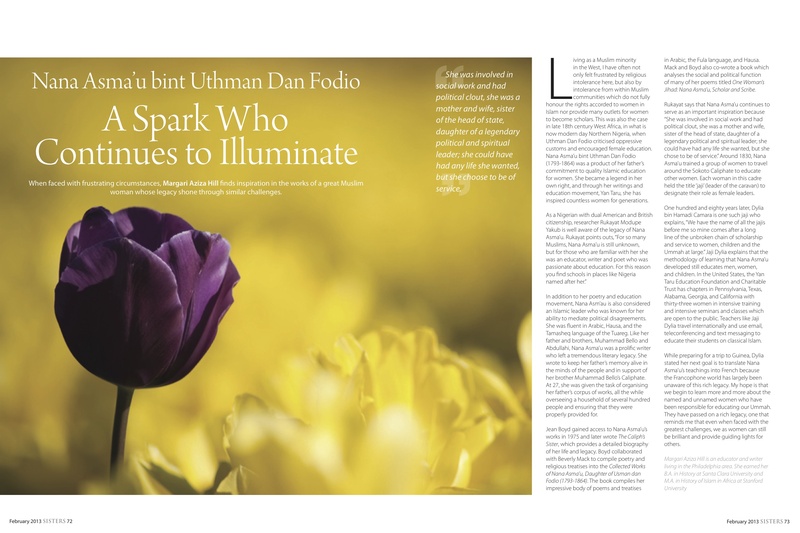 You can read find other stories of inspirational Muslim women, along with this one, in the February edition SISTERS magazine . *Jaji Dylia updated us and told us that Yan Taru trust has chapters in Baltimore, Pittsburgh, Los Angeles, Sacramento, Oakland , Florida and Massachusetts. She also has some students in Toronto who are not Yan Taru. She is currently in Benin, where she also has students. To date, Dylia translated Tanbeeh l Ghafileen and prays that Allah grants her the himma to translate even more in the future, insha’Allah. Salaams Dear: I am SO happy you are writing again! JAK for bringing to light the story of this sister. So many Muslim women’s stories are unknown by the world! Salaam Margari, I love your writing and have known about your blog for a handful of years now. I’m just curious if you teach at the university level. Your research and writing is unique and covers the often hidden women of color (or just women period convert or not) voice and should have a place for young students like myself to learn from. Its sorely needed. Your kind of insights and research will not be found at masajids or at 99.9% of muslim events/seminars. You are an inspiration. JAK.